The Atrium Gallery was developed by RISCA as an effort to bring recognition to the refined talents of artists from diverse communities located across the state. On a rotating basis, the Atrium Gallery hosts multidisciplinary exhibits in partnership with community artists and local art and cultural organizations. Since its inception, the Atrium Gallery carries a focus on preserving the cultural aspect of art, and the influence both culture and tradition have over the visual art form. At the Atrium Gallery, local artists are given the opportunity to collaborate and network with fellow artists who share the same cultural background as them. In the last decade, RISCA has added several new exhibits to the existing Latin American and Black Art Exhibits. This includes the Asian Art Exhibit, Diversity Art Exhibit, Native American Art Exhibit, Cape Verdean Art Exhibit, Middle Eastern Art Exhibit, and Youth Art Exhibit, which features the emerging talents of students from AS220 Youth, Riverzedge, RISD Project Open Door, and New Urban Arts. The expansion of the Atrium Gallery exhibits has led to the creation of an integrated hub of artistic talent, with a focus on celebrating and preserving culture. In same vein as the other exhibits, in 2018 there will be a Folk Arts Exhibit where artists will reflect their aesthetic heritage and the traditions of their community. Over the years, RISCA has formed fruitful and productive partnerships with the RI Department of Administration, Office of Diversity, Equity and Opportunity (ODEO), The Governor’s Office, AS220, RISD Project Open Door, VSA Arts of Rhode Island, Art League of RI, The Artists Loop, The Pawtucket Arts Collaborative, The Laotian Community Center, and The Tomaquag Museum. These partnerships have led to the development of other complementary programs such as The New Visions/New Curator Series, which provides mentorship opportunities to artists endeavoring to curate their own shows. Other programs include, The International Artist and Cultural Exchange Program, which brings together three modes of expression: art, music, and literature that celebrates inter-cultural art in multi-disciplinary forms at several venues across Rhode Island. Additionally, the Atrium Gallery Traveling Exhibit provides artists the opportunity to have their work showcased while gaining the attention of other Rhode Island and New England cities. The State Native American Art Exhibit at the Atrium Gallery has been celebrated since 2012 and holds the distinction of being the first regional and state art exhibit for Native American art. The exhibition features work from the Native Community that represents a traditional and contemporary approach to Native American art in a variety of mediums. The exhibit is comprised of beautifully crafted cradleboards, rattles, necklaces, bags, moccasins, and baskets featuring years of generational traditions that have been passed down. Natural ornate materials are often incorporate such as turkey feathers, deer hides, antlers, claws, wooden beads, turtle and sea shells that are applied or interwoven to create exquisitely authentic and interpretive art. Beautiful portraits, war shield and scenic paintings often complete the collection. The mission of the Native American Art Exhibit is to sustain the culture of the Eastern Woodland Indigenous People and allow every story to be told and heard. Their traditions, both old and new, evoke a story of cultural preservation. The Asian Art Exhibit celebrates the communities and contributions of both visual and performing artists from China, Cambodia, Hmong Community, Korea, Laos, Pakistan, Japan, Sri Lanka, India, and Indonesia. The Asian Art Exhibit provides great opportunities to develop and strengthen relationships among these diverse countries, as well as raise awareness and promote the talent and culture of local Asian artists. The Asian Art Exhibit also holds the distinction of being the first exhibit to showcase Asian artwork on a statewide level. Some of the organizations that have participated in the past 5 years have been the Laotian Community Center of Rhode Island, Cambodian Society, Rhode Island Kung Fu Club, Lifespan Asian Employee Resource Group, Socio-Economic Development Center for Southeast Asians, Hmong United Association of RI, Khmer City Rockers, Indian Museum & Heritage Society, Raksmey Kampuchae Music Group, RI Japan Society, Language and Cultural Center, and Silk Road Center. The Black Art Exhibit showcases the exciting works of art featuring many gifted artists from the black community. The incredible artwork expresses their culture and highlights unique stories through a vast array of art forms, from photography to paintings. Starting from its initiation in 2003, the Black Art Exhibit was a partnership between the Rhode Island Department of Administration Human Resources Outreach and Diversity (HROD) Office and the Rhode Island Black Heritage Society (RIBHS). This collaboration with RIBHS continued for several years, during which the Atrium Gallery attracted and showcased the works of talented artists from the black community. Since 2009, through the contributions of the Community Arts Program at RISCA, the Black Art Exhibit has expanded to greater lengths, adding additional groups and art mediums. Rhode Island State Council on the Arts is grateful to partner with community based organizations as well as individual artists. RISCA hopes to continue to celebrate the talents and artistic gifts from communities of color for many years to come. The Diversity Art Exhibit represents the idea that visual art serves as an universal form of creative expression that can transcend cultural boundaries. The exhibits honor the unifying force of visual creativity and the multi-cultural community of Rhode Island. The Diversity Exhibit is part of an ongoing partnership between Rhode Island State Council on the Arts (RISCA) and the RI Department of Diversity, Equity and Opportunity and culturally specific non-profit organizations. The Atrium Gallery at One Capitol Hill encourages the development of new curators and gallery directors from communities of color with New Visions/New Curators Series, which provides mentorship and opportunities to curate several exhibits at the Atrium Gallery. As one of the most anticipated art exhibits at the Atrium Gallery, The Youth Art Exhibit has been part of RISCA’s “New Visions/New Curator Series” since 2011. Together, students conceptualize the theme of the exhibit, create the artwork, the brochure, and proudly put their artwork on display. AS220 Youth, Riverzedge, RISD Project Open Door, and New Urban Arts have participated in the program with remarkably successful results. The Latin American Art Exhibit brings recognition to the diverse, artistic talents of individuals from the thriving Latin American community. These individuals are from various Latin American countries such as Costa Rica and Argentina, and they are all brought together under the umbrella of the Latin American Art Exhibit. All artists never leave the memories of their country behind and proudly share with us their pride and love for both their culture and the arts. The Latin American exhibit is dedicated to preserving the art, culture, and heritage of the Latin American community. The Atrium Gallery at One Capitol Hill encourages the development of new curators and gallery directors from diverse communities through the New Visions/New Curator Series program. Artists of color are provided the guidance and mentorship needed to curate a show at the Atrium Gallery. Some of these artists end up curating more shows in the future. The initiation of the Atrium Gallery Traveling Exhibits Program, in partnership with Warwick Art Museum, Attleboro Art Museum, and the Courthouse Center for the Arts, has grown to include the Newport Art Museum. These exhibits originated at the Atrium Gallery, and through travel, the work of diverse artists are showcased and gained the attention of other Rhode Island and New England cities. The mission of the Traveling Exhibits Program is to have artists and their work to be known and recognized in other cities, and for communities to interact where organic partnerships and relationships can develop and advance. 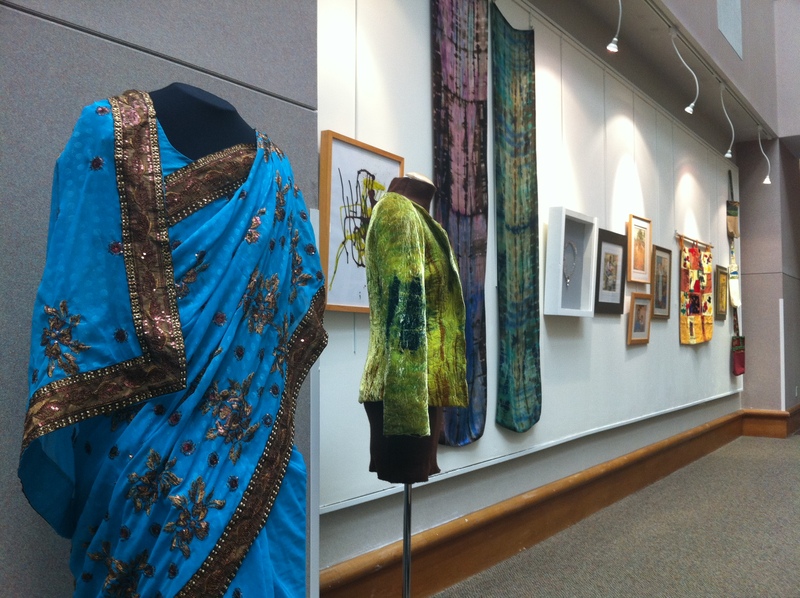 In 2009, Celebrating Diversity was initially on display at the Atrium Gallery located on One Capitol Hill. This multi-cultural exhibition represents the greatness that can be achieved when we embrace diversity and inclusion. The exhibition launched as a group show that included the work of artists currently living in Rhode Island. After an overwhelming response to the exhibit, it grew to incorporate a range of artists that live and work in Massachusetts, Connecticut, and New York. This expansion has stimulated an intriguing collection of reflections and statements. The International Artist and Cultural Exchange Program is a partnership between Rhode Island State Council on the Arts (RISCA) Atrium Gallery, AS220 Artist in Residency program, the Warwick Art Museum, Providence Community Library, Brown University Watson Institute Center for Latin American and Caribbean Studies, the Ibero-American Film Festival, and Gallery Z. Many international artists have been affiliated with the program including Cuban abstract visual artist Reynier Ferrer, Dominican fiber artist Julianny Ariza, Sri Lankan installation artists Chaminda Gamage, T.P.G. Amarajeewa, and Ecuadorian artist Illdefonso Franco. The partnership includes community workshops, artist talks, film screening, panel discussions, and art exhibits at the Atrium Gallery, Warwick Art Museum, Attleboro Art Museum, and Newport Art Museum. These series of events bring together three modes of expression: art, music, and literature and celebrates inter-cultural art in multi-disciplinary forms at several venues across Rhode Island.